NEED A POST HOLE DUG? Post Hole Depot is your source for digging, prepping and setting posts for various projects. Whether you need a few holes dug or you're a contractor looking for high volume digging, count on Post Hole Depot to get the job done! Our team of experienced professionals will make sure your digging experience is a smooth one. We service the GTA and surrounding area. With years of experience, our committed professionals are dedicated to give you accurate post hole digging. We put customer satisfaction on top that is the reason why our each customer gives high rates to our services. Whether you need Post hole digging in Toronto or Post hole digger in Scarborough, it is time to look no further as you can rely on our experienced professionals for whom no job is too big or too small. Our clients consist of a huge range of landscape and construction contractors, house builders, pool companies, and property repairs companies, masons, fencing contracting firms, and of course homeowners. Thanks for visiting our website; our phone lines are always open to cater our clients. 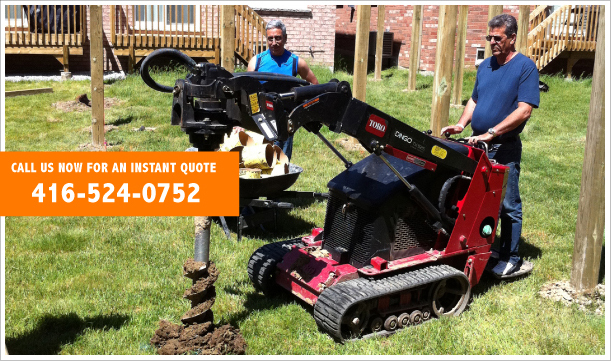 If you need a post hole dug, then do not wait, call us now! •Dig and Set (We will dig and set your posts we provide the mortar mix) posts provided by client. •We mark your property for Post setting. You must contact Ontario One at 1 800-400-2255 or www.on1call.com to request a utility check for your property.